I love spending time with my family and friends also, I think that people have to work a lot in modern life to achieve anything, so when we get a free moment we love spending it together. 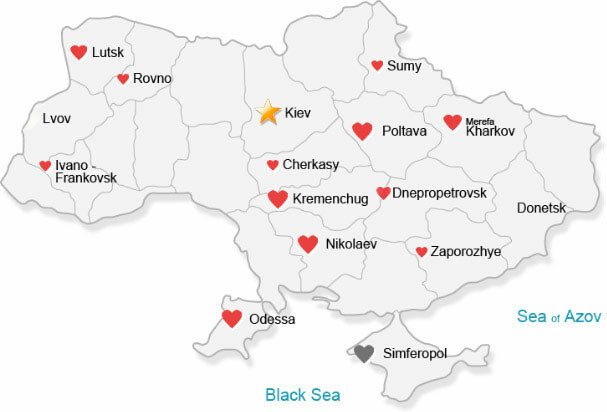 Why is our Ukrainian marriage agency so popular? We have been working for years and achieved the position of the largest and a very popular matchmaking agency in Ukraine. How did we manage it? Everything is very simple! Services of our Ukraine bride service are of high quality. All correspondence is confidential. The mission of our marriage agency is to bring two lonely hearts together, no matter how large is the distance between them. We make our best to help you to find your other half. There is a Gallery of Ladies on our site where you can find profiles of more than 1000+ single Russian and Ukrainian women from 13 cities and towns of Ukraine. UaDreams works more than 10 years in Ukraine. It sounds great, doesn't it? During this time we gained a reputation of a reliable dating agency that provides confidential services. Every week our members come to our offices in various cities of Ukraine to meet their ladies there. A lot of men have already found their wives on UaDreams.com and are satified with our services. Read testimonials written by our members who visited Ukraine. Why are we a number 1 matchmaking agency? You are completely safe with us. Our Ladies Gallery doesn't contain 50,000 women's profiles like other matchmaking agencies do. Why do we have much less registered women? We scrictly monitor documents of all women who come to our Ukrainian dating agency. We check the girls' matrimonial status. We make it in order to protect you from scammers and any kind of fraud. Believe that it is very easy to meet a lady of your dreams with our help! Your first letter to any woman is always free! Do you want to see how she smiles to you? Use Video Chat, a very popular service among our members! An interesting detail: when you invite a lady to Video Chat, you don't have to spend money for restaurants. On the occasion of various holidays our marriage agency in Ukraine presents you free chat minutes, E-mail and photo credits. In case you have any questions, you are welcome to contact the support center of our matchmaking agency. We will reply you within 24 hours. Do you want to call us? You are welcome to do it as well! Everything is at your disposal. Our marriage agency will support you from your first mail to visiting your lady in Ukraine! More than 50 professional translators work in our Ukraine brides agency. They do their best to pass your tender words to the lady as correctly and accurately as possible. If you want to make a surprise for your lady, we will help you to choose the gift and deliver it to your beloved lady. Do you have any extraordinary ideas? Our dating agency Ukraine will help you to realize any of them! When you will be ready to see your beloved girl in real life, our Ukrainian marriage agency will organize a trip to Ukraine for you. Your visit will be organized to the highest standards. It's wonderful. I'm not the best at writing down things but from the minute I arrived things just started out great. I actually meet my lady & Alexandra at the door. We had great Chemistry at first sight. We spent a little time at the office and then went with Alexandra to the restaurant where we had a wonderful dinner and wonderful conversation. The night went extremely well and I plan to use the services of translation as my lady and I see more of each other.